Jeremiah wrote two books, this and Lamentations (which contains his lamenting over the destruction of Jerusalem). The book of Jeremiah contains both events in his life regarding Jerusalem, as well as his prophecies. He began his calling in the days of King Josiah, who was considered a righteous king. Jeremiah was probably a key counselor for Josiah. Josiah reigned for over 30 years (640-609 BC), during which he refurbished the temple, observed the Passover, and destroyed idolatry out of the land (much of which was implemented by his own grandfather, Manasseh). Josiah was killed in battle when he went out against the Egyptian army that was going north to fight against the Babylonians. Sadly, Josiah’s four sons were not as righteous as he was. In a short time, Josiah was succeeded by Jehoahaz, Jehoiakim, Jeconiah (Jehoiakim’s son), and finally Zedekiah. Jehoahaz was king for three months, then deposed by the Egyptian king Necho as he returned from Babylon and carried off into Egypt. Necho placed Jehoiakim on the throne, and Jerusalem was their tributary. Jehoiakim reigned for 11 years and died. His son, Jeconiah replaced him, but only reigned for three months. The Babylonians’ first siege of Jerusalem led to his being deposed, carried off to Babylon. Nebuchadnezzar replaced Jeconiah with Zedekiah, his uncle. Zedekiah was 21 years old when he began his reign as a tributary nation under Babylon. Though Jeremiah began as his counselor, Zedekiah and the elders/leaders of the city-state chose a life of wickedness and rejected Jeremiah and the other prophets. It is in this timeframe that we find Lehi and other prophets crying repentance to the Jews in Jerusalem. However, as we find, the Jews stoned many of the prophets (1 Nephi 1), and rejected their words. Jeremiah is no different, as he suffered many sore trials under the evil of the sons of Josiah. Early in his service during the reign of Josiah, we find that God called Jeremiah as a prophet. This specific calling of a prophet often involved a theophany: a vision of God on his throne or at the altar (c.f. ; Gen 28:10-22, Isaiah 6:1-6). In Jeremiah’s case, he comes to understand that he was called even before he was in his mother’s womb. This fits in nicely with Isaiah’s vision of the premortal divine council, where he received his call to the work, or that of the Savior in the premortal existence (Abraham 3:22-28). Given that God tells Jeremiah that he was ordained before this life strongly suggests that Jeremiah existed before this life. It makes no sense to presume God ordained someone or something that doesn’t yet exist, which would be the case if there were no premortal existence. But Jeremiah clearly existed before, and as with many of the other ancient prophets, was called to his calling, not only in mortality, but in his premortal state. “6 Then said I, Ah, Lord God! behold, I cannot speak: for I am a child. Here we see a common event with many prophets. They feel incapable of fulfilling such a major task (Moses 6:26-33, Exodus 4:10), and the Lord insists that he will fill their mouths with his words. Isaiah’s mouth was touched with a not coal from the altar before God’s throne and his speech was cleansed, preparing him to preach to the people, much like Jeremiah’s mouth is touched and filled with God’s words. While Josiah closely followed the counsels of the prophet, Jeremiah was rejected by his successors. Even after being humbled and carried off by Egyptian and Babylonian kings, the people of Jerusalem and their leaders were eager to defy God. They were convinced that they were living as was expected, and did not want to hear the harbinger’s warning voice. Jeremiah was beaten and put in stocks by the temple’s chief governor, Pashur (ch 20). The prophet was unjustly accused, arrested and thrown into prison. As if that wasn’t enough, he was then tossed into the dungeon, which stank and was filled with vermin and plague. Zedekiah eventually delivered him from the dungeon, but put him back into the prison (Jer 37-38). We learn that the major sins of the people included: 1) “they are gone far from me, and have walked after vanity, and are become vain? “ (vs 5), 2) “Hath a nation changed their gods, which are yet no gods? but my people have changed their glory for that which doth not profit” (vs 11). The Lord places it on two key issues: “For my people have committed two evils; they have forsaken me the fountain of living waters, and hewed them out cisterns, broken cisterns, that can hold no water” (vs 13). The people had rejected the living waters, and sought to create their own water supply in his stead. But if they had looked they would have realized that their efforts were not delivering them from either the Egyptians or the Babylonians. Only God was able to do that. But in vanity, their pride caused them to rise above God and his prophets. We find that the people rejected Lehi, who also received his call as a prophet in the time of Jeremiah (1 Nephi 1). They sought to kill him, forcing him to flee with his family. In returning to obtain the plates of brass, Nephi explains the ways of the people in Jerusalem. Laban, a powerful member of the ruling caste, who controlled a key set of scripture for the Jews, showed just how wicked the people had become. When Lehi’s sons attempted to first talk with Laban, and then later offer him a bribe, the man sent his soldiers to slay them, hoping to obtain their riches for themselves (1 Nephi 3-4). That Nephi, disguised as Laban, causes no alarm to the servant Zoram, when told to carry the precious plates out in the middle of the night to the brothers, suggests that such was a common event. Laban was involved in midnight dealings with the other princes of Jerusalem, enriching himself while the enemy encircled them. Isaiah warned about such government leaders when he proclaimed they sought to steal all the land, while ransacking the poor (Isa 5:8; 3:15). We see such occurring in Jeremiah’s day, as he is tossed without cause into prison/dungeon, and caused to suffer. 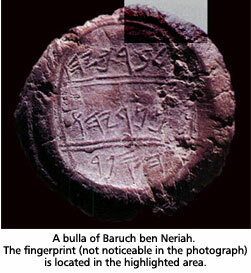 Jeremiah’s scribe Baruch’s document bulla (the clay impression of the seal) with his finger print. Some Christians are inerrantists. They claim that the Bible as we now have it is perfect and without any errors. However, Jeremiah showed that corruption in the scriptures were occurring even in his day. “8 How do ye say, We are wise, and the law of the Lord is with us? Lo, certainly in vain made he it; the pen of the scribes is in vain” (Jer 8:8). If the pen of the scribes, those royal and temple writers and copiers of scripture, is in vain, then just how accurate was their writings? How had they changed the writings of Moses or Isaiah? Today, many Bible scholars show that there were several versions of the books of Moses floating around, some combined in the time of Jeremiah to bring forth a mixture of writings that are occasionally complementary and often contradictory. In Josiah’s reign, the book of Deuteronomy was found in the temple, which many scholars believe was enhanced and rewritten by the temple scribes to include many of their current practices. The Deuteronomists were guilty of changing the First Temple’s rites. Originally they included a tree of life, angels, Messiah and other important symbols and teachings. These were replaced with a greater focus on the law of Moses, as found in Deuteronomy. In an article on the inerrant view of the Bible, Barry Bickmore quoted Justin Martyr, an early Christian defender, who noted that the writings of Jeremiah had even been changed! What we find from Jeremiah’s account is that the scriptures were not important to the kings or people of his day. Jeremiah received revelation which God commanded him to write down and read to the king. Jeremiah’s scribe, Baruch, took down the revelation. When it was read before King Jehoiakim, he picked it up with his knife and tossed it in the flames. God’s response was to have Jeremiah write it again, with many more teachings and warnings (Jer 36). The scriptures are important to us. They are foundational documents. But they are of limited use if we reject the living prophets. They are even more limited if we change them, destroy them from our lives, or pick and choose which scriptures will be of value to us. We may be able to burn the parchment, but we are still responsible for the words that come from the prophet’s mouth.